With idea of moving forward with the commune,(2) there have been discussions about the “communal city.” Can you explain what this is all about? With the political experience and strength we have in this territory and with the work we have been doing, El Maizal has found itself in a collective leadership role for all this area of Simón Planas, and perhaps also in the rest of Lara state. We have gotten a lot of solidarity and many friends among social and popular movements in Lara and throughout Venezuela. So with all this experience, and knowing that this process cannot be held back–it is growing day by day with popular initiatives, proposals and participation–we believe that it is time to stop thinking just about El Maizal and move towards a bigger organization, at a higher level, in order to build our dream of socialism, as President Chávez used to say. Far from being a utopia, I think it is something achievable. Here in El Maizal there is a commune, which is permanently under construction, but which has been moving forward, and for us this progress makes sense. That is why we have dedicated our lives to this. We have the political clout to go to other territories and call on people to organize in a communal city, in a large organization that will contribute to developing the plans and projects addressing the needs of the people, but especially with the people themselves building and defending such projects. More than a discourse, we need to offer tangible results so that people can see for themselves that this makes sense. The communal city project is not going to be easy. The principal enemy is the right-wing, because the communal city at some point will imply “communalizing” the territory. That project involves a broader scope and more power, in particular taking charge of means of production: factories, companies, etc. So we will be struggling for power in the face of forces that already exist. The bourgeoisie, for economic reasons, wants to put the brakes on Chavismo. Sadly, the reformist sectors in our camp are also looking to rein in on on the tendencies and political currents that threaten the privileges that some politicians in our government, or people close to them, have become accustomed to. I think there is some political exhaustion, worn out politicians that have no initiative anymore. There are many politicians that might be over the hill, perhaps they believed that Chavismo was going to die with Chávez, or that president Maduro was going to be overthrown. Many have dedicated themselves in these past years to accruing riches and privileges while keeping popular participation at an arm’s length. But at least here in Simón Planas they have another thing coming, because here there is a political force that will not be stopped and which does not depend on one person. In my case, I simply take on the role of a spokesperson, one that is accountable and who always acts coherently accordingly to our people’s interests. What’s more, while we are here talking, there are people out there working, holding assemblies, having meetings, organizing activities, voluntary work projects, etc. There is a very interesting dynamic which keeps the spirit of the commune alive. The communal city will bring together all the activity that has taken place in the area in a broader sense, involving multiple territories around here where the people relate in one way or another to the political and communal movement in Simón Planas. What is the current status of the Simón Planas mayorship issue? When we discuss this issue, it is important to recall the context in which it happened. In 2017 we were facing a very tough crisis: an economic, political, and (I would also say) moral crisis, a crisis of values. There was, and still is, an international aggression against Venezuela, as if punishing us for having gone through this very interesting revolutionary process together with Chávez. But, despite being a very tough year, 2017 was also a year of great achievements and advances from the communal perspective, both in political and electoral as well as productive terms. When President Nicolas Maduro proposed the National Constituent Assembly (ANC), we, as the organized pueblo here in Simón Planas, took to the trenches, participated in that election, and won with over 80% of the vote. I had been charged with being the territorial candidate to the ANC. Then came the regional and municipal elections, in October and December, respectively. In the municipal elections, our community proposed that we participate in that process, and the communal movement of Simón Planas again assigned me the responsibility of being the candidate for mayor. Then a lot of things happened. Unfortunately, both right-wing political forces and by forces within our government harassed us. These are regrettable things, that come from people that hold a great deal of power. We were denied the chance to run on the ticket of the PSUV’s (the governing party) and that of other parties of the patriotic coalition, but we managed to do it with the Patria Para Todos party (PPT). What followed was a great victory for the communards. We really routed the PSUV, handing them their first defeat in this municipality, which is one of the more Chavista and “PSUVista” municipalities of all Venezuela. What happened after the election? Despite winning in the midst of threats, blackmail and pressure, our victory was not recognized (perhaps that was to be expected). Our votes were assigned to the PSUV candidate. We went through a whole legal process with the electoral authorities–we filed an appeal before the Supreme Court–but so far there has been no response. Our position is that, if the communards’ victory in Simón Planas is not going to be recognized, at least the results should be voided and new elections held. Everything we have done is legal, so we hope for a resolution to this case. Unfortunately, there have been no pronouncements. Instead, the issue has been ignored. Nevertheless, we know that having the mayor’s office is not indispensable for our project. We will not stop producing, we will not stop organizing, we will not cease to vote for the Revolution nor to support president Maduro. We have always made this clear. We have never wavered on our support for Nicolás Maduro, because we believe that with Maduro in the presidency we can continue to move forward and not towards confrontation. Because of a municipality, or the actions of a party, or because at one point the government did not pay heed to us, we are not going to lose sight of the strategic enemy. We remain Chavistas. What role, in your opinion, can the commune play in the current Venezuelan context? From my point of view, if the government looked more closely at the communal issue, it would realize that the commune holds the solution to the crisis we are living through and could ideologically deepen the Chavista project (the task of building socialism that Chávez set for us). The commune, with its dynamic of production and participation, can also help free us from our dependence on private capital and on government patronage. So long as, the “cells” are built across the country and we also work to develop people’s political conscience, a new culture and new relations between communities that prioritize the common good, then we can make strides towards this model of society that comandante Chávez proposed. Unfortunately, there are big contradictions inside the state, between the state and the popular social movements, and between the state and the commune. Because the government is very powerful economically, it has the capacity to make big decisions, and sometimes with a single blow, it can put an end to interesting experiences. In El Maizal we have had the determination, the strength and the ability to withstand the blows dealt to our organization, to our experiment. There have been acts of sabotage, but we have resisted. Beyond resisting, we also need to go on the offensive against the enemy before us, whether it is the bourgeoisie, the oligarchy, or reformism. The reformists aim to protect a system that sidelined a class which for a long time accumulated riches to make way for a new bureaucratic bourgeoisie that, despite its revolutionary discourse, pays no heed to the people’s cries. We are not willing to live under those conditions, we are not willing to let Chavismo fall, nor to let reformism do in Venezuela what perhaps took place in Brazil or Argentina, where there have been significant setbacks. 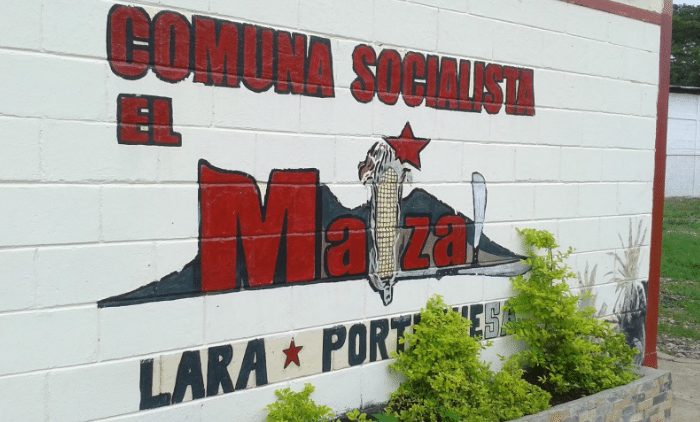 ↩ In a forthcoming article, we will delve into the productive activities of the El Maizal commune, as well as its complex relationship with the state. ↩ The commune was proposed by Chávez as a fundamental unit of popular power for the construction of socialism. Bringing together communal councils and other organizations, the idea of the commune is to allow the community to wield power directly through assemblies, gradually taking control of both the means of production and the various instances of political power. Chávez presented many of these ideas in his landmark broadcast Aló Presidente Teórico #1.